The Ebright Azimuth is the point with the highest benchmark monument elevation in the U.S. state of Delaware. It is marked with a geodetic benchmark monument and has an elevation of 447.85 feet (136.50 m) above sea level. The only state high-point with a lower elevation is Britton Hill in the state of Florida at 345 feet (105 m) above sea level. The Ebright Azimuth  is located about 6.5 miles (10.5 km) north of downtown Wilmington, Delaware, in far northern New Castle County, within a few feet of the Pennsylvania state line. It is near Concord High School, to the north of Naamans Road, at the middle of the intersection of Ebright Road and Ramblewood Drive. This is an entrance to the Dartmouth Woods development. Since the schematic photograph was taken the blue and yellow monument sign has been moved across the street closer to the geodetic marker. A curb extension has been installed and the area around the sign has been modestly landscaped. Like most of their early microwave relay sites, Western Union decommissioned the Brandywine installation near Ebright Azimuth as more-reliable broadband fiber systems were developed. The structure now supports several VHF and UHF land mobile radio antennas. ^ a b "Highest Point in Delaware". 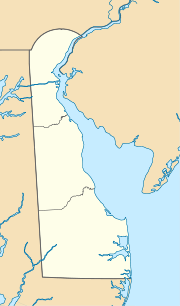 Delaware Geological Survey. Retrieved 2008-12-17. ^ a b "Regarding the highest point in Delaware". Delaware Repeater Association. Archived from the original on 2009-03-06. Retrieved 2008-12-17. ^ "Ebright Azimuth, Delaware". Peakbagger.com. Retrieved 2012-10-17. ^ a b "Ebright". NGS data sheet. U.S. National Geodetic Survey. ^ "Radio Stations Operated by the Western Union Telegraph Company" (JPG). Plant and Engineering Department. Western Union Telegraph Company (archived by A Secret Landscape). 1959. Retrieved 2008-12-17. ^ "Radio Relay Systems". New York, Washington, Pittsburg. archived by A Secret Landscape. Retrieved 2008-12-11. "Historic Markers with Google Maps". State of Delaware. Retrieved 2008-12-17.